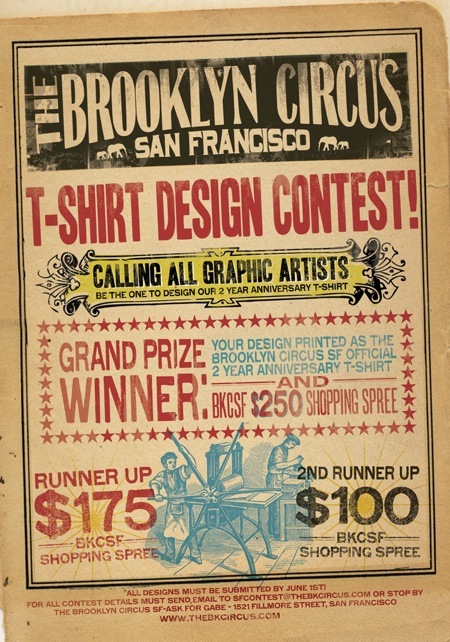 The Brooklyn Circus T Shirt Design Contest: Are you up for the challenge? The San Francisco-based men’s and women’s boutique is having a contest to design their 2 year anniversary T shirt! The grand prize winner gets their design printed as The Brooklyn Circus SF Official “2 Year Anniversary Tee” and a $250 shopping spree. The first runner up gets a $175 shopping spree and the second runner up gets a $100 shopping spree. For complete contest details send an email to SFContest@thebkcircus.com or stop by The Brooklyn Circus (1521 Fillmore Street, SF) and ask for Gabe.